Little Blue Marble 2018 anthology now available! Little Blue Marble is published and edited by SF Canada member Katrina Archer, a software engineer, author, and editor. There is only one little blue marble for all of us so far. Little Blue Marble’s goal is to bring greater awareness of the consequences and potential solutions to anthropogenic climate change. The site links to great content from around the web and publishes original articles and works of speculative fiction. The Little Blue Marble 2018 anthology is now available. All of this year’s great stories in one spot for your reading pleasure, including works by SF Canada members Holly Schofield and Melissa Yuan-Innes. From rising tides to edible homes, weather control and tornado killers, floating city-states and plant-based humans, the anthology brings you poignant, sometimes hopeful but often biting visions of our futures living with climate change. Help spread awareness of climate change by purchasing the anthology or via Little Blue Marble’s Patreon. SF Canada member Lisa Timpf has been busy lately! 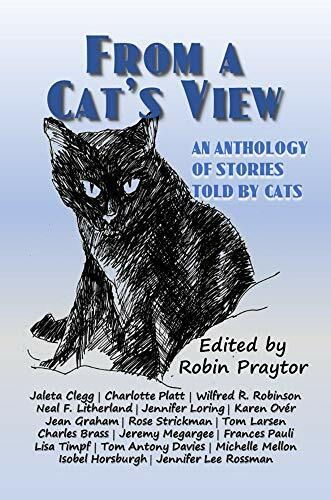 Her story, “A Cat’s Confession”, about a ship’s cat serving aboard the Galactic Space Ship Meech Lake plus two poems inspired by her cat, Smokey, recently appeared in the anthology From A Cat’s View. This unique anthology offers fascinating insights into the relationship between humans and their feline owners. Pick up a copy at Post to Print Publishers — it’s the purrrfect gift for cat lovers everywhere. Her short story, “The Caller”, appears in the Future Days anthology issued by Castrum Press. New Myths has published a story and a poem by Lisa. “Gone” is about an AI-enhanced dog looking for a missing master and “What Really Happened” is a different take on the Gingham Dog and Calico Cat. Read both for free at New Myths. 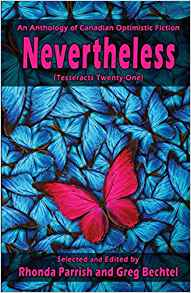 Her poem entitled “With Two Left Feet” appears in the Tesseracts anthology Nevertheless. In connection with that book’s promotion, Lisa contributed to their “Bright Spots” blog with a piece entitled “Step By Step” that draws on her recovery from knee surgery. A sci-fi short story entitled “What Lies Beneath” was included in Nomadic Delirium’s November 2018 edition of Environmental Holocaust. The story follows the efforts of a Hamilton-based researcher to combat the spread of a virus. A sci-fi poem entitled “History Waits to be Written” was published in Polar Borealis #7. And her sci-fi poem “Ghost Stories” was included in the Sounds of the Night anthology from Alban Lake Publishing. Lisa’s writing has appeared in a variety of other venues, including Star*Line, Eye to the Telescope, Thema, and Third Flatiron. Find her at http://lisatimpf.blogspot.com/. SF Canada member Sally McBride is pleased to announce she has just signed a contract for a short story “The Paisley Snow” to appear soon in The Cockroach Conservatory, Vol. 1: Working Zealot’s Guide to Gaining Capital in Pre-Apocalyptic America. As well, her short story, “My Mother’s Garden”, will appear in Exile Editions’ upcoming Food of My People anthology edited by Ursula Pflug and Candas Jane Dorsey. 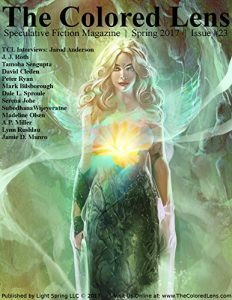 And her short story, “Thank Yew Very Much”, is currently out in On Spec magazine (Vol. 28 #4). SF Canada is well-represented in the newest Tesseracts (the twentieth in the series), published by Edge Science Fiction and Fantasy. Compostela is edited by Spider Robinson (an SF Canada member) and James Alan Gardner, and includes stories and/or poetry by SFC members Chantal Boudreau, Rhea Rose, Robert Dawson, Nancy S.M. Waldman, Leslie Brown, Linda DeMeulemeester, and Matthew Hughes. 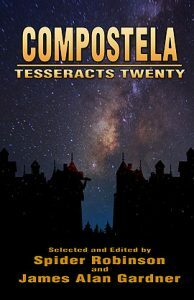 From the publisher’s website: The stories contained within the pages of Compostela are a reflection of the world we live in today; where science produces both wonders and horrors; and will leave us with a future that undoubtedly will contain both. Journeys to the stars may be exhilarating and mind-expanding, but they can also be dangerous or even tragic. SF has always reflected that wide range of possibilities. For more than 1,000 years, Santiago de Compostela (Compostela means “field of stars”) has attracted pilgrims to walk to the cathedral that holds St. James the apostle’s relics. The stories in this anthology in their own way tell the tale of futuristic travelers who journey into the dark outer (or inner) reaches of space, searching for their own connections to the past, present and future relics of their time. Compostela is currently available to order on Amazon Kindle, and will release in other ebook formats and in print in the fall of this year. SF Canada member Dale L. Sproule announces two recent short fiction publications. His story “Ladder of Ashes,” a ghost story set in an old British settlement in Myanmar, appears in the Spring 2017 issue of The Colored Lens. A previous story of Dale’s, “Along Dominion Road,” appeared in issue #17 of the magazine and is free to read on the site, here. 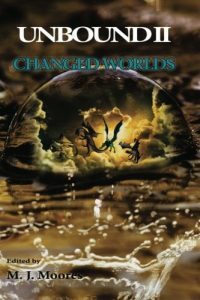 Another recent story, “The Birthing Blades,” co-written with Sally McBride, appears in the anthology Unbound 2 – Changed Worlds. The anthology is available on Amazon. Keep up with Dale’s news on his website at http://dlsproule.blogspot.ca/. 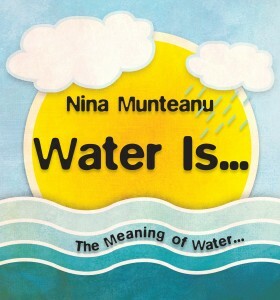 SF Canada member Nina Munteau‘s book, Water Is… was chosen by Margaret Atwood in the New York Times as her #1 choice in “The Year in Reading” for 2016. You can find her comments here. Water Canada has also recommended the book as a summer read. Nina talks more about The Meaning of Writing and Water in this video interview. 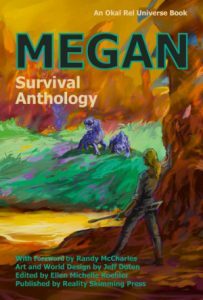 In other news, Nina’s short story, “Fingal’s Cave,” was recently published in the Megan Survival Anthology series. After crash landing on a hostile jungle planet, rebel-scientist Izumi sets out against orders on a hunch that may ultimately save her fellow survivors but risk everything. Still haunted by the meaningless death of her family, Izumi’s intrepid search for life becomes an existential journey of the heart that explores how we connect and communicate—with one another and the universe—a journey intimately connected with water. You can find “Fingal’s Cave” on Smashwords, and Water Is… and Nina’s other titles on Amazon.ca. Finally, Nina will be editing an anthology for Reality Skimming Press based around the theme of water. “Stories must use real or realistic science based on the theme of water in the near future (50-100 years from 2017). Your story must be considered optimistic—this does not mean that bad things can’t happen in your story, but there has to be an optimistic twist and an optimistic ending (a happy ending or hope for a happy ending).” Submissions for the anthology are currently open, and full submission guidelines can be found here.